I went to confession after attending The Way of the Cross on Good Friday. Confession is one of two sacraments, along with Anointing of the Sick, that can be celebrated on Good Friday. Not surprisingly I stood in a line for over a half hour in order to confess my sins. As a weekly/biweekly Confession goer I have come to realize that lent is the only time of year I can expect to stand in a line to receve the sacriment. On many weeks of the year I am the only one in line. I find it sad that so many only chose to exercise their ability to receve absolution for their sins once a year. Why is this? Is it because it is uncomfortable to confront our own faults? I can assure you it is. The feeling of shame when confronting failure, at least for me, has never gone away. Many critics of the sacrament tell me that they don’t believe that they don’t believe that one should confess to a priest. They say that our sins are between themselves and God. To me that just doesn’t seem like enough. Other than the fact that this belief is unbiblical, I tend to believe that a simple I’m sorry while standing alone is a bit too easy, too casual, and can become too thoughtless of an act. No, it is far more humbling to have to sit and meditate on our own frailties. To sit and ponder our failures to our savior that has given us so much is a horrible feeling. To a God that is infinitely good even one sin is infinitely evil. 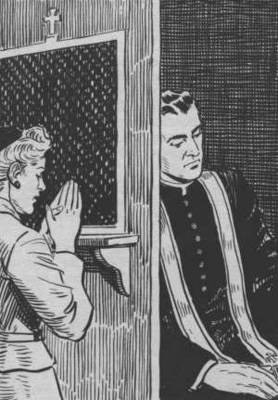 If you are someone who only confesses once or twice a year, or even a person who has been away from the sacrament for twenty years or more; I encourage you to join me in regular confession. As bad as it feels to confront our own sins it is impossible to quantify the graces you receive and the feeling of relief you have knowing that you are forgiven. I went the week prior to Palm Sunday. There was no line up at all. It was an older man and then me, and that was it. Maybe tonight the Priest will be doing confessions, since Easter Vigil isn’t until 9pm. I was encouraged on Holy Thursday though when I saw one family sitting in the front row who all got up for Holy Communion and crossed their arms in front of the minister so as to just receive a blessing and not the Eucharist. I wish more people who attended Mass at Easter were that honest. Very sad to hear that you did not have the same experience. The lines at several churches that I have attended this lent have all had longer than normal lines at the confessional. That’s ok. I shouldn’t complain. The pews were full this weekend for the Easter services, and I even saw some people crossing their arms so as not to receive communion.